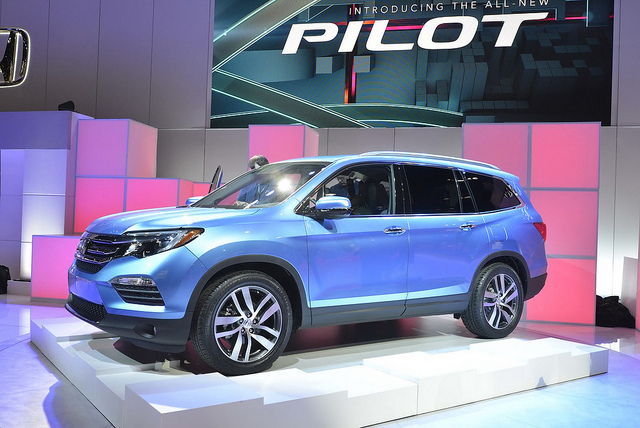 The Honda Pilot is an extremely popular crossover SUV sold on the market today. The auto features three rows, and a very ‘car-like’ ride. The stock engine for the automobile is a 3.5 liter six-cylinder rated at 280 horsepower coupled to a six-speed automatic transmission. When buying the auto new, consumers can choose to upgrade from front to all-wheel drive, and both the Touring and Elite trims of the vehicle have a nine-speed automatic transmission. The Honda all-wheel drive system delivers torque vectoring to improve vehicle handling in inclement weather. The overall gas mileage rating of the crossover is 19 MPG (city) and 26 MPG (highway). The Pilot can go from zero to 60 MPH in just 6.1 seconds, and the auto has a top overall speed of 114 MPH.